Dear Readers, Bank Exam Race for the Year 2018 is already started, To enrich your preparation here we have providing new series of Practice Questions on Reasoning Ability – Seating Arrangement .Candidates those who are preparing for SBI Clerk and IDBI Executive 2018 Exams can practice these questions daily and make your preparation effective. 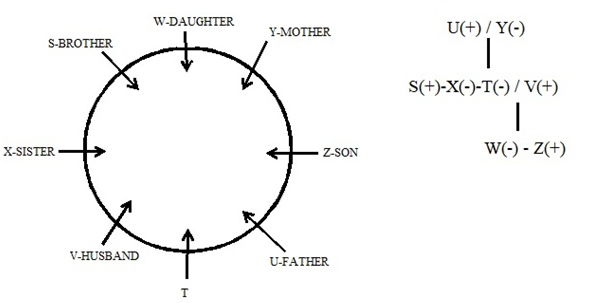 S, T, U, V, W, X, Y and Z are sitting around a circular table facing the centre, but not necessarily in the same order. Each of them is also related to T in some way or the other. There were three person sit between T’s husband and Y. W sits third to the right of U. Only one person sits between W and T’s son. There were three person sit between T’s father and T’s brother. T’s daughter sits second to the right of Z. T sits on the immediate left of U. V sits to the immediate right of X. T’s sister sits third to the right of T’s mother. T’s father sits second to the right of V. Only one person sits between S and T’s husband. Y sits on the immediate right of T’s son. 1. How many persons are there between T and T’s daughter? T sits on the immediate left of U.W sits third to the right of U.Only one person sits between W and T’s son.Y sits on the immediate right of T’s son.There were three person sit between T’s husband and Y.Only one person sits between S and T’s husband. V sits to the immediate right of X.T’s father sits second to the right of V. T’s daughter sits second to the right of Z. There were three person sit between T’s father and T’s brother.T’s sister sits third to the right of T’s mother. Case 1: T’s daughter sits second to the right of Z. 2. Who among the following is son of T? 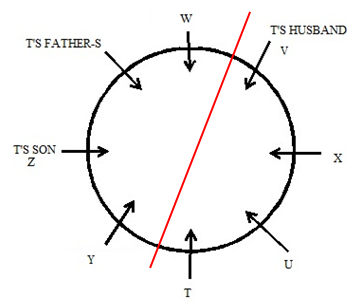 3. Who among the following is mother-in-law of V? 4. Who among the following is second to the right of T’s mother? 5. Who among the following sits second to the left of T? There were seven people A, B, C, D, E, F and G seated in a row from left to right. The one who is sitting at the left end is termed as 1 and the one who is sitting at the right end is termed as 7. All of them like different books such as History, Tamil, English, Maths, Physics, Chemistry and GK but not necessarily in the same order. B, who does not like Chemistry, sits after the person who is immediately after A. E likes English book. The one who likes History book sits at sixth position. The one who likes Tamil book sits second to the left of the one who likes Maths book. G sits on the immediate right of D and on the immediate left of C. F sits to the immediate left of the one who likes GK. A likes Physics book and sits at the fifth position. There were two person sit between the one who likes English book and the one who likes Tamil book. 6. Who among the following likes GK book? The one who likes History book sits at sixth position.A likes Physics book and sits at the fifth position. B, who does not like Chemistry, sits after the person who is immediately after A.G sits on the immediate right of D and on the immediate left of C.F sits to the immediate left of the one who likes GK. E likes English book.The one who likes Tamil book sits second to the left of the one who likes Maths book. There were two person sit between the one who likes English book and the one who likes Tamil book. CASE 1: The one who likes Tamil book sits second to the left of the one who likes Maths book. 7. Who among the following sits at the extreme ends of the line? 8. Which of the following combination is true? 9. How many persons are there between G and the one who likes Physics? If A is related to English and C is related to Chemistry then in the same way B is related to? Q1. How many persons are there between T and T’s daughter? Q2. Who among the following is son of T? Q3. Who among the following is mother-in-law of V? Q4. Who among the following is second to the right of T’s mother? Q5. Who among the following sits second to the left of T? Q6. Who among the following likes GK book? Q7. Who among the following sits at the extreme ends of the line? Q8. Which of the following combination is true? Q9. How many persons are there between G and the one who likes Physics? Q10. If A is related to English and C is related to Chemistry then in the same way B is related to?